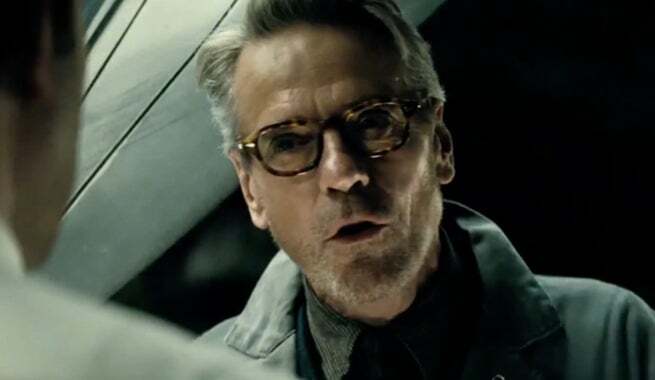 Jeremy Irons, whose take on Alfred Pennyworth was generally considered one of the best performances in last month's Batman V Superman: Dawn of Justice, will appear in Justice League: Part One. Showbiz 411 say that Irons confirmed as much during a recent conversation, and while it's the first quasi-official confirmation of the fact, it's also not very surprising: it seems clear at least part of the movie will take place in Gotham City, given the introduction of J.K. Simmons as Commissioner James Gordon to the film. Justice League Part One, directed by Zack Snyder, is filming now. It also stars Henry Cavill as Superman, Ben Affleck as Batman, Gal Gadot as Wonder Woman, Jason Momoa as Aquaman, Ray Fisher as Cyborg, and Ezra Miller as The Flash. Spider-Man villain Willem Dafoe has joined the cast in an as-yet-undisclosed role.